Last night I received my daily update from my online food allergy support group based here in Tampa Bay. Normally what goes on the bulletin board stays on the bulletin board and I don't post it here on the blog, but Tracey, the mom, has given permission to share her story. I am just sick to my stomach at what this family is enduring. A first grade girl in Edgewater, Florida, has a life threatening peanut allergy. The school is making appropriate accommodations based on her physician's recommendations and the Section 504 requirements of the Americans with Disabilities Act. The kids wash their hands and rinse their mouths upon entering the classroom in the morning and after lunch. Food is not permitted in the classroom. Mom supplied allergen free treats for a Valentine's Day party for the entire first grade, though, so that everyone could celebrate. So far, this is almost identical to my son's classroom. What happened next couldn't be more different. A group of parents decided that their children's rights were being infringed upon and picketed outside the school yesterday and today against the food allergy accommodations being made for a first grade girl. I'm just going to stop here for a minute so you can go read that last sentence again. When you're done yelling at your computer, come on back. Then the media began reporting on what they are calling a "controversy". In the Channel 13 video, at least the reporters took the time to speak to the family and share their side. The online story, though, has a dreadful, alliterative headline about "peanut panic" and ran a poll in the sidebar to their story that could have been written by one of the protesters, asking "Should one student's medical condition impact the entire student body?" They received enough complaints that they eventually changed it to "Do you agree with the school district’s response to the student’s peanut allergy?" but kept the results from the previous, biased question. The Orlando Sentinel mom blogger Koshii Eslinger must have thought she was taking a balanced view by calling both sides "extreme" in her Mom at Work post. She suggests that Tracey take her inconvenient little girl elsewhere, either private school or home school, but it's because she's such a good parent that she would do anything to keep her daughter safe. To their credit, the protesters aren't actually trying to run a child out of school, they just want to endanger her life while she's there. The one sliver of good news in the middle of all this hatred is that Tracey's daughter happened to be home sick for yesterday's protests. Her parents decided to keep her home today, as well, upon learning about today's planned picket. So she missed school to protect her from these parents' outrageous, bullying behavior. Fortunately she also missed an opportunity to watch the news coverage with her classmates when the teacher decided to show it on television today. I'll wait here for you to finish yelling again after that last sentence. I've been hesitant to speculate upon the role of the school's staff in stirring up the protest, but I'm starting to suspect that there might be a lack of compassion and judgement among some members of the faculty. The most ironic part of this wildly misreported narrative is that it all occurred on the same day as the White House began a conference on bullying prevention. I've discussed the painful prevalence of food allergy bullying before, but part of the difficulty in this story is that it is being treated as a disagreement, rather than a naked attempt to bully a child with a disability. If these protesters were opposed to the inconvenience of having their children walk around a wheelchair ramp or upset that a disabled child has a "special" bathroom stall with handrails, they would, quite frankly, have been immediately recognized as a bunch of loudmouthed jerks trying to push a school district and an innocent family around. Instead we are being given a vivid demonstration of how to teach a child to become a bully. Update: Here's the flyer the protesters were handing out. 2nd Update: To clarify, these descriptions of the allergy accommodations by the protesters are NOT ACCURATE. 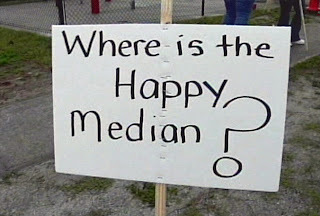 They are mischaracterizations, exaggerations and flat out lies, twisting the facts into a parody much like this sign. Update the third: I finally have a post up accurately describing the food allergy accommodations at two different Florida schools for Tracey's daughter and my son. Also a Facebook group has been started to support the Bailey family, if you'd like to join. I'm shocked that these parents are this ignorant! So sad! Poor little girl, poor family, and shame on those ___! This is really upsetting..not right! This is disgusting. There just aren't any other words. Thank you for writing this post to get the real story out there. I have been sick about this all day and to hear that the teachers showed the coverage to the class pushed me right over the edge. These parents that are protesting should be ASHAMED of themselves. Ignorant, entitled, selfish, mean bigots. Our whole household has been so upset all day over this story-My grandson has the same allergies. These parents-if they should be allowed to have that title because of their ignorance-need to be set straight that a little girls life is at stake. Be adults and don't get so upset about an extra hand washing event!! AMEN! And thanks for the video. I hadn't seen the video, and I'm adding it to my own blog post about this situation. I can't believe this behavior, and listening to the parents involved in the protest just disgusts me. They should be ashamed of themselves for wanting to put this child's life in danger. And that's exactly what they are doing, and they need to be told that to their faces - YOU WANT TO ENDANGER THIS LITTLE GIRL'S LIFE SO THAT YOUR CHILD CAN EAT PEANUTS AT SCHOOL! YOU ARE EVIL! I'm not done yelling, either. Ugh...I can't get the video to post. Oh well. I found a nice one with Dr. Oz talking about food allergies. Love it! Didn't any of these people hear about Katelyn Carolson? Do they want that to happen in their town? What "rights" are being infringed upon here? The right to snacks and dirty hands? There's no other word than disgusting to describe the teacher showing the news footage to the students. She just gave the "OK" to all of them to pick on this poor girl forever. "We're going to need to get rid of all these ramps, so my kid can walk up steps..." makes as much sense here. 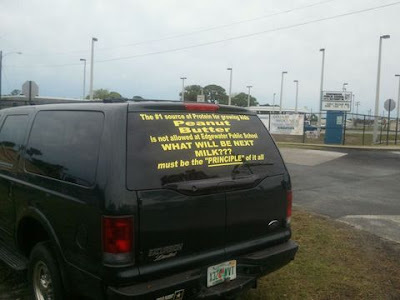 My counter to car window and parked next to picket line: "A child's #1 source of idiocy is THEIR PARENTS, just like these you see here >>>"
But what does that solve? We should ignore them because this child has rights and I hope her parents are strong enough to tell her to keep going to school and she will be safe. I just read "Ruby Bridges" last week to my son. Similar message. Keep the good fight. THIS IS OUTRAGEOUS!Shame on those parents, shame on the teacher, shame on the students for making the situation sound worse than it is. They can go home and have a peanut butter and jelly sandwich where it won't endanger a LIFE!!! The mom bought snacks for the entire first grade? I'd say she's trying to make the best out of an inconvenient situation. Shame shame shame on these parents! While reading articles on this today I came across a board with the emails for the principal of the school if anyone would like to write them. I live nearby and i'm absolutely fuming over this. I don't even have words right now. I blogged about this too today, but your post is way more detailed! Thank you for the extra information. I am appalled. Is this real? I am disgusted. My heart goes out to both the parents and the child. How could the principal allow this? The silver lining, look at how much conversation is taking place over this sad issue of adult bullying AND lack of education. Luckily from what I have read, the rest of the world condems these small minded biggots for what they are. I like the "Skip the Peanut Butter" one. Ha ha. As the mother of a peanut allergic child, I applaud you for sharing this on your blog to emphasize what complete IDIOTS these parents are. I am fuming. And where in the hell did that so called physician go to medical school? I wouldn't qualify death as a minor reaction, even if there's only a minor chance it could happen. I'm sickened, outraged, and heartbroken to say the least. I haven't been about to post about this on my blog yet because it just sends me into tears! I think your post is just what this family needs. I plan to share it on both my personal and blog facebook pages. Has the school addressed this in a public statement to let the community know what the real facts are are? Or are they just letting these bullies spread the lies? Where is the school board and principal. What are they doing about the teacher who is encouraging this? Well said Libby! Not only are you a great cook but you are also a great writer. My heart breaks for Tracey's family. Jack has the same accommodations at his school and I have not been met by any protests. In fact I get a lot of parents saying "I hope we are in your class again next year". I sent Jack's teacher a thank you note last night, but I also now feel that I should send one to the principal, asst principal, nurse, aides, etc. My peanut-allergic nephew has attended this school for four years. I feel for Tracey's family and understand the difficulties they're having getting people to understand, and I think these protesting parents are teaching their children intolerance and modeling bullying. But I also think there's some 'conclusion jumping' going on on our side too. Yes, it seems unrealistic, but the school IS requiring students wipe their hands with Clorox wipes (not faces, but hands). NO OUTSIDE FOOD is a school-wide rule. I support that. Why feed kids junk at school anyway?! No class gets any holiday party with food. This is wise. However, the school bent the rule for Tracey's class. Her class IS allowed food-centered parties when Tracey's mom brings in the food. So no other class can have a party unless Tracey's mom brings in food for them too. Of course, that's not going to happen. Everyone needs to take some deep breaths, apply the rules across the board, and then just get back to living and teaching their kids to be nice. I just sent the following email to the principal and assistant principal. It sums up my feelings. Like the First Grade girl at your school, my 10-year-old son, Eric, has life-threatening food allergies. Not to peanuts, but to milk, eggs, fish and shellfish. And I can tell you, watching your child struggle to breathe because they accidentally ate “dangerous” foods is about the worst feeling in the world. Before today, we had only had to do the EpiPen on my son 3 times. But he actually had a severe reaction this morning, and ended up in the hospital. So thinking about the day my son endured, I can’t imagine knowingly letting another child take such a risk. I am so fortunate to have almost total support at my school. There will always be the people who don’t “get it,” but the administration, parents and students at my school has been terrific. Moms are actually happy that their kids wipe their hands (with baby wipes) because it reduces the spread of germs, as well as allergens. And I have worked really hard on milk-free, egg-free, peanut-free recipes (there are peanut-allergic kids in my son’s class), so that the kids are actually excited when I bring in treats. I truly wish everyone could walk in our family’s shoes for just one day, and they would see the incredible stress food allergies cause the child, family, siblings, marriage, etc. They would also realize how blessed they are to be able to eat at a restaurant. My son is the only child in the entire school who has never eaten ice cream or pizza. Life with food allergies is hard enough, but having selfish, bullying adults stir the pot is absolutely unforgivable. I hope your school has learned a lesson in decency and humanity. I just saw a video clip of this story on CNN. I feel so bad for the girl and her parents. These people are MEAN. They are being bullies. What scares me about this story is the kids of these parents, will ofcourse think their parents are right. I hope the kids don't take it out on the girl. All they are learning from their parents is how to be selfish, whine and bully others. Don't they have anything beter to do, than complain that their kids have to wash their hands? It's a shame that the adults here are irrational. I thought we had it bad but this is the most horrible thing I've ever seen. I hope this issue gets to the attention of our federal government so that something can finally be done about this. These are INNOCENT CHILDREN people are hurting! I read on the local 6 facebook page that one of organizers of the protests (in her own words) suggested that this little girl wear a mask and gloves to school as an appropriate accommodation because she wants to protect this "baby" too. As if she has any place whatsoever determining medical accommodations. There were so many violations of privacy here that I hope the board of education comes down on all involved. Just evil. and the principal does nothing?? what? does he live under a rock? sheesh...what is this world coming to? This is a civil rights issue. Your child is being bullied because of their race, ethnicity, or disability, and local help is not working to solve the problem. Contact the U.S. Department of Education’s Office on Civil Rights. I just watched this video clip. What happened to real reporters that ask questions???? The mom that said 30 minutes was taking out of education during the day. why didn't she have to have any fact to back that up. Why didn't she go through the schedule and prove this. Also, the comments that their children shouldn't miss out on experiences. WHOA - since when is eating peanut products part of an education?? How does having food in the classroom give a better education. Didn't these "adults" learn those golden rules when they were young, be good to your neighbor, treat others as you would yourself, be respectful of others. Instead they're discriminating against this little girl because of a medical disability. where is this video from and how can it be shared? I also feel bad for the little girl. But I feel bad for her because her parents are risking her life by sending her to a public school instead of truly taking her health condition into account and finding a safe place for her to learn (be it a private school/special needs setting or homeschooling). In their effort to garner attention and demand "normalcy" they are crippling her by teaching her that the world will always bend over backwards to accommodate her. In reality her condition is so serious that their focus should be on teaching her that she indeed has special needs, she will need to be aware of her own surroundings and other people's food choices probably forever. Yes she's only 6 years old but her condition is life threatening, never too young to start teaching how to self protect and make accommodations for herself when need be. Life isn't always fair and equal some people DO have different or special needs. As a parent of three I believe it's my job to teach my kids to make reasonable efforts to help and accommodate others with special needs. But the special needs parents should also be teaching their children that sometimes accommodations can't (or shouldn't) be made and how the kids should be able to help themselves when those times come. For what it's worth I do agree that those particular parents in NJ seem like idiots. I don't know that they share 1/2 a brain between them. If you're going to make a stand and be angry enough to protest at least make your points valid and moderately intelligent. Is there a NJ story too? I thought this happened in florida. As an adult with a severe peanut allergy, this makes me sick. I can't even imagine what will happen to this poor little girl's self-worth when she realizes what is going on at her school. I'll be blogging about this as well. Just more virulent hate-filled rhetoric from the Fox news and hate radio brainwashed tea-partiers. I wasn't been home much this weekend, so I haven't been able to respond to each of you like I'd like to. I've added a link for those of you looking for the source of the video. There are updates to the situation in the post after this one. All I can do is cry. This is so sad! This situation with girl and her family still makes me so sad, I can't watch either local or CNN video. This is why I will be applying for Section 504 plan from ADA and Office of Civil Rights from the get go getting my daughter in Kindergarten next year! If the staff can't handle it or if reaction happens out of failure to comply with 504, the case will go right to the top of district Administration, OCR complaint filed and school system loses federal funding. My Name is Jan Roman-Gonzales and I live in South Lake Tahoe, Ca. We have a child enrolled in our local elementary school "Lake Tahoe Eviromental Science Magnet School. We as a whole coummunity never thought it an inconvience or loss of rights to accomedate this child with the severe peanut allergy. Our Superitent Dr. James Tarwater would never allowed parents to protest and spred such lies.But then again he didn't need to. Maybe this community in Florida can learn from our example. Do these parents realize how they are hurting this child with the allergies and what lessons they are teaching their own children? There are laws to protect children from bullying and the school district needs to take action. They are PEANUTS. One food that is being asked to not be in the classroom. Are they telling me that there are NO OTHER foods that can be eaten at parties? Are there no other things that can be placed between bread for protein? What about soy butter, almond butter, etc. They are sold at Wal-Mart. They aren't a specialty iten. Shouldn't kids be washing their hands, anyway? I would be THRILLED if students had to wash their hands a few times a day- it may cut down on lost time due to colds/flu. This is a sad world where it is acceptable for a child to die, b/c it is unacceptable that another child not be allowed peanuts/products in the classroom. All I can say is that hope the bully parents never have a child with any difference or disability. I cannot imagine that they are capable of the strength and compassion needed to care for special kids. What horrible people. I just stumbled upon this story by accident. I live in CA and hadn't heard anything about it. We have a two year old with a PA and we are constantly worrying about what we will do when she starts school. After reading this I can't stop the tears and can barely put together an intelligent thought. I am so terrified for my daughters future I feel like I can't breathe. 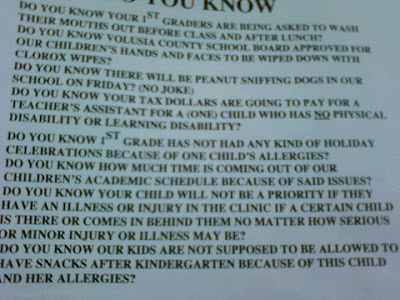 I am a rather severe allergy suffer myself, but I kind of have to side with the protesting parents. Picketing is cruel and I don't agree with that at all, but section 504 really only requires reasonable accomodations, and I am not quite sure this is reasonable. The update does sound closer to reasonable. My allergies are only digestion, but I never asked for anything special. Teachers knew, but I also knew what to avoid. I have a wacky diet due to allergies, but I have never ever asked anyone else to share my wacky diet. I am appalled at the idea of anyone else having to suffer my diet restrictions along with me, especially the thought of a whole school. That seems worse to me. I have mixed feelings about this, even though I realize that this kid is much more severly allergic than even me. My issue is that even as an adult, I have multiple food allergies. Peanuts are one of the few safe foods I had as a kid. So by helping one kid, it is severly limiting kids with other allergies. Most foods are allergic to some kids. Where does it end? What fools! going on a news station! do they really realize what they say? If it were their kid, I wonder if they'd care as much. My daughter suffers from severe cold urticaria as well as food allergies to fish and shellfish. She also has severe ADD. All of these issues required accommodations. It never ceased to amaze me how unaccommodating so many of the teachers were (can't possibly turn off music that is a distraction to my child because the other kids like it, or can't keep other kids from having tuna sandwiches in the room even though it means my child will be vomiting and struggling to breathe, or insisting that my child SWIM for PE class even though that was a life-threatening activity). And the less accommodating the teachers, the more brazenly bullying were the other students, and in turn their parents. I think in some cases it simply required educating folks as to the severe consequences of the lack of accommodations. In some cases, though, it required fear of law suits. It was never easy or fun, but it was worth the battle. I am just so glad; she grew up and got through all of that, and now is a successful college student who demands her own accommodations successfully because she watched her Mom and Dad fight for them for her for years. I really hope the same for this small child... and I hope that the struggles get easier as people become more aware of these allergies and disabilities. Just because someone can't SEE a disability (no wheel chair or braces) doesn't mean it doesn't exist!